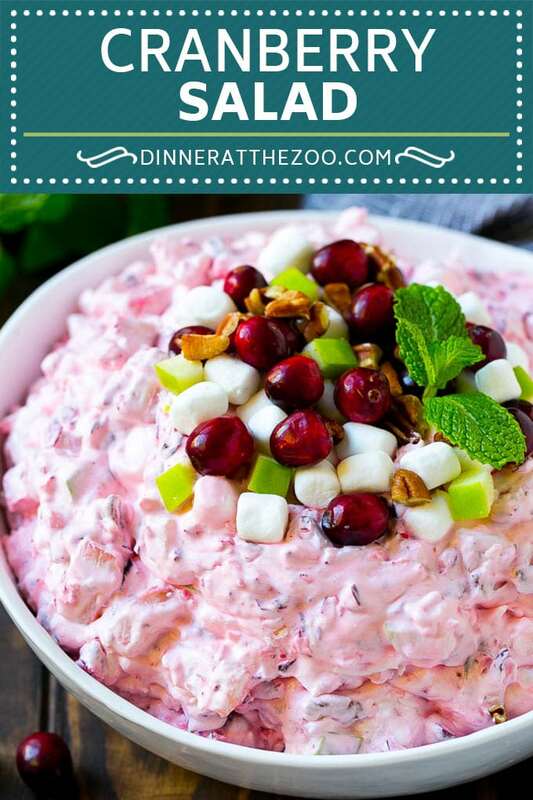 This creamy cranberry salad is a blend of fresh cranberries, pineapple, marshmallows, pecans, coconut and apples, all tossed in a creamy dressing. A unique and colorful salad that’s perfect for the holidays! I love to serve cranberry salad alongside herb roasted turkey or crock pot ham for an easy and festive side dish. This is always one of the first side dishes to disappear on Thanksgiving! I’m always looking for fun ways to serve cranberries other than your standard cranberry sauce. This cranberry salad is perfectly sweet and full of different flavors and textures. How do you make cranberry salad? This recipe starts with a bag of fresh cranberries. The cranberries are chopped, then mixed with sugar. The cranberries need to sit in the sugar for at least 3 hours to temper some of the natural tart flavor of the berries. When the cranberries are ready, pineapple, marshmallows, chopped pecans, shredded coconut and diced apples get added to the mix. The final step is to add whipped topping as a dressing, then you’re ready to eat. I like to decorate my finished salad with more cranberries, marshmallows and fruit, but that’s an optional step. 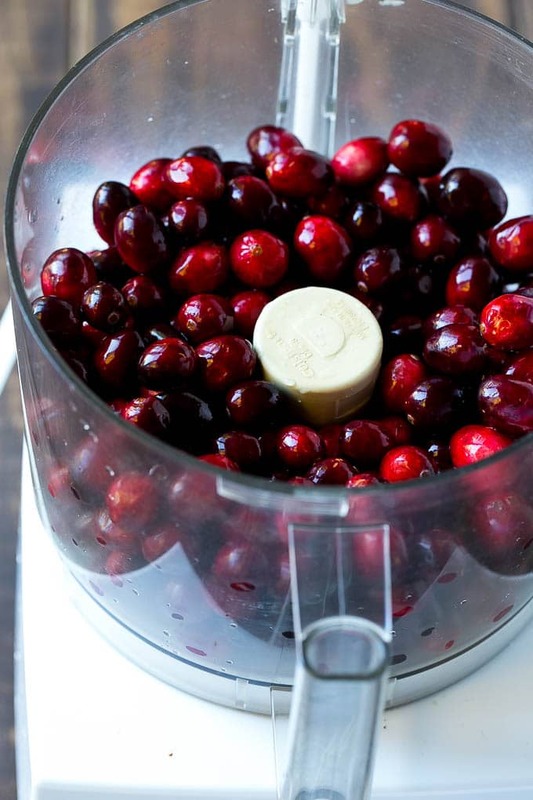 I use a food processor to chop my cranberries. Don’t want to use whipped topping? You can use lightly sweetened freshly whipped cream instead, or vanilla yogurt. I typically use Granny Smith apples because they add a nice crunch and I like the color contrast of the green apples against the red cranberries. That being said, feel free to use your favorite variety of apple. You can use fresh or canned pineapple for this salad. Sometimes I substitute diced mandarin oranges for pineapple for a different take on this dish. Don’t like pecans? Omit them altogether, or try walnuts instead. How do you make cranberry salad with Jello? There are a couple of different types of cranberry salad. 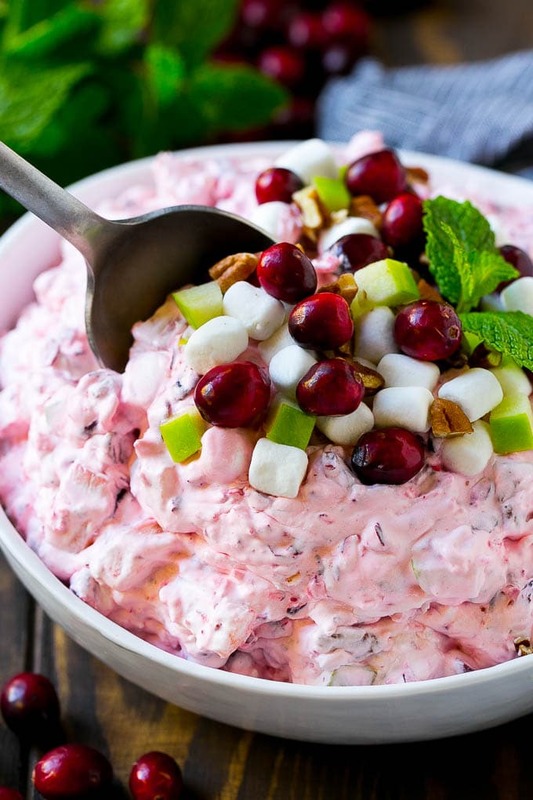 While this is a creamy salad, cranberry Jello salad is also a very popular option. I have a super delicious gelatin based salad recipe that you can find here. 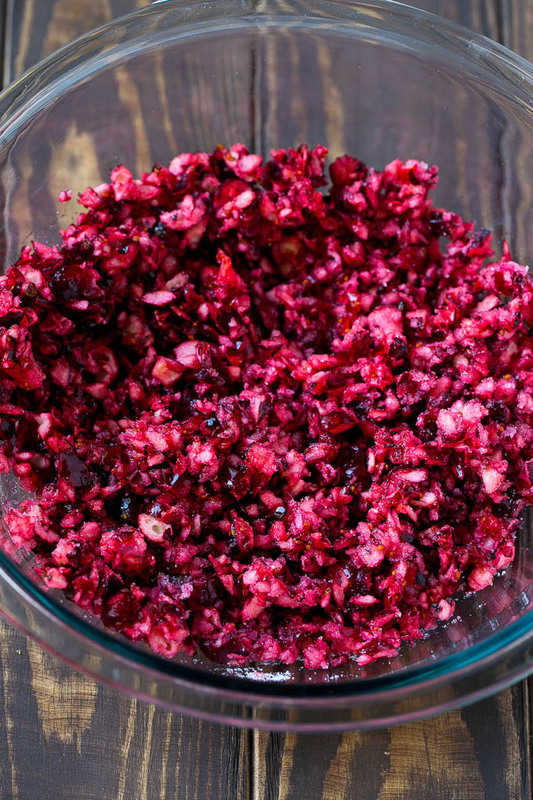 Can you use frozen cranberries for cranberry salad? You can substitute thawed frozen cranberries for fresh cranberries in this salad, although the texture will be a little different. Fresh cranberries will have a little more crunch and texture than frozen cranberries. Cranberries are considered a healthy food because they’re high in nutrients and antioxidants. Cranberries have been proven to prevent certain types of cancer, improve your immune system and decrease blood pressure. 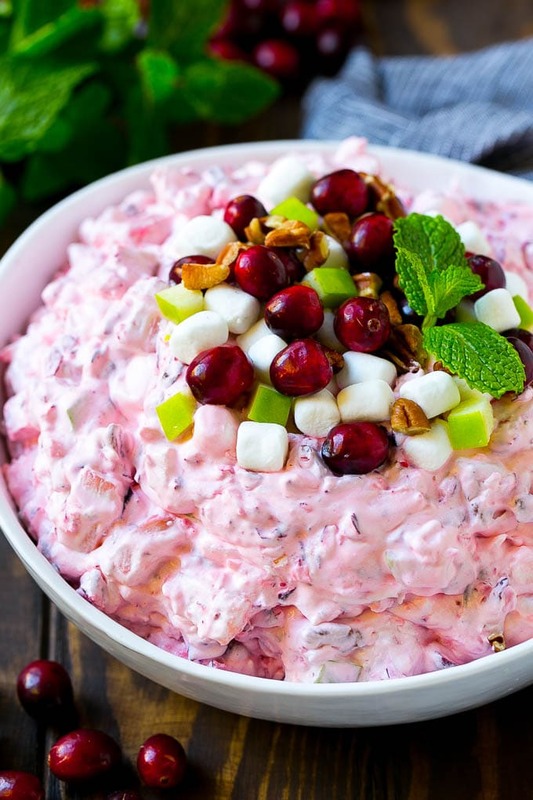 While this cranberry salad isn’t the healthiest choice because of the whipped topping, you could substitute something else such as yogurt for more nutritional benefits. Once you try creamy cranberry salad, you’ll be hooked. This is a big favorite with the kids too, because no child can resist mini marshmallows! This creamy cranberry salad is a blend of fresh cranberries, pineapple, marshmallows, pecans, coconut and apples, all tossed in a creamy dressing. A unique and colorful salad that's perfect for the holidays! Place the cranberries and sugar in a glass or plastic bowl (do not use metal). Stir to combine. Cover the bowl and chill for at least 3 hours. 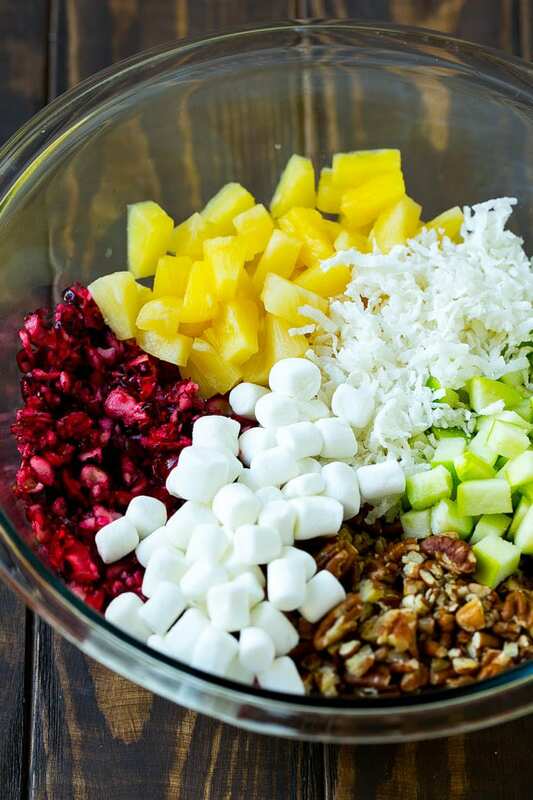 Add the apple, pineapple, marshmallows, pecans and coconut to the bowl. Add the whipped topping to the bowl and fold gently to combine all the ingredients. Garnish with additional cranberries, apples and marshmallows if desired, then serve. This cranberry salad looks so delicious! I am going to have to make it for Thanksgiving!